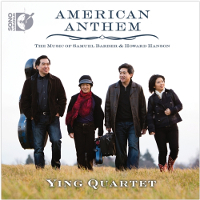 The Ying Quartet occupies a position of unique prominence in the classical music world, combining brilliantly communicative performances with a fearlessly imaginative view of chamber music in today’s world. Now in its second decade as a quartet, the Quartet has established itself as an ensemble of the highest musical qualifications in its tours across the United States and abroad. Their performances regularly take place in many of the world’s most important concert halls, from Carnegie Hall to the Sydney Opera House. 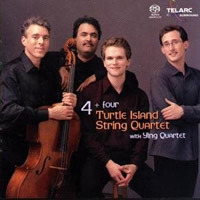 At the same time, the Quartet’s belief that concert music can also be a meaningful part of everyday life has also drawn the foursome to perform in settings as diverse as the workplace, schools, juvenile prisons, and the White House. In fact, the Ying Quartet’s constant quest to explore the creative possibilities of the string quartet has led it to an unusually diverse array of musical projects and interests. As quartet-in-residence at the Eastman School of Music, the Ying Quartet maintains full time faculty positions in the String and Chamber Music Departments. The three string quartets were all written in just a few weeks in the summer of 1842, and his writing for strings is, for better or worse, rather pianistic. It is unfortunate that some would dispatch the significance and beauty of these works so easily. 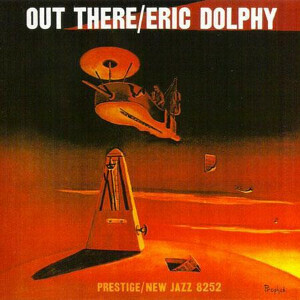 Though there are passages and textures in the quartets that are clearly influenced by keyboard technique, this is glorious music. The imagination and wit, vitality and virtuosity, subtlety and nuance, and heartfelt yearning and emotion that are displayed throughout the quartets are enough to be as satisfying as any of Schumann’s music. Each one of them is a joy to perform. Since all of the quartets were written in just a few short weeks, it is interesting to take them (Op. 41, Nos. 1, 2 and 3) as a set and consider the similarities and differences between each of the corresponding movements. For example, all three of the first movements are primarily gentle in nature and convey a sense of unfolding, though there are dynamic and energetic moments within. None of them begin with forceful, dramatic intensity to grab an audience; instead, Schumann uses an intimate quality and a sense of drawing the listener in to define the emotional world of these quartets. Two of the three first movements also end in a wonderfully quiet and peaceful way. 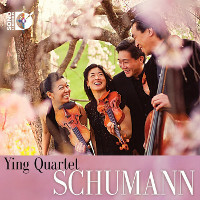 Neatly comprising Schumann&apos;s string quartets, the Ying Quartet make a very good case for these works indeed. There is not a marking in the score that goes unobserved and the opening of the first quartet is certainly expressive before the allegro that must be close to the ideal, allowing for tension and relaxation with only slight rubato. The Ying&apos;s do not inhabit the "hyper-dynamics" school interpretation either, ably demonstrated in the second movement where each sforzando is carefully nuanced according to its relative position in the structure of the phrase. 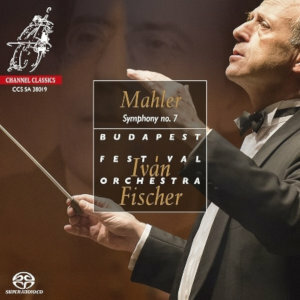 In the glorious slow movement, the violin and cello pour their respective hearts out for us; this is very fine "long line" playing indeed and marks a clear distinction musically between what is otherwise a clear tribute to Mendelssohn. The finale is taken quickly and is invested with a sheer drive that sets the pulse racing; for our pleasure, they take all repeats and it is to the Ying&apos;s great credit that this moto perpetuo is so musically played (it would be all too easy to turn it into a pure vehicle for virtuoso display). The hymn-like chorale just before the dashing coda is wonderfully rapt until the undulating dynamics disturb the poise before the brilliant close. The second quartet shows more signs of maturity from Schumann with many of the rhythmic games he played (and that seemingly inspired Mahler amongst others) being more obviously displayed; as with any good performance, the Ying&apos;s manage to trick the mind into adjusting the bar lines as these tricks begin and end without any obvious "spotlighting". As in the first quartet, even when the material is "static" on the page, the response of these players leaves the listener in no doubt of the trajectory of both the phrase and the movement. The range of sonority employed by the Ying&apos;s is much wider than one usually hears in Schumann; the are moments in the Theme & Variations (2nd movement) where their suddenly bare textures brings to mind the opening of Pärt&apos;s Fratres - extraordinary and strangely it doesn&apos;t sound remotely out of place. 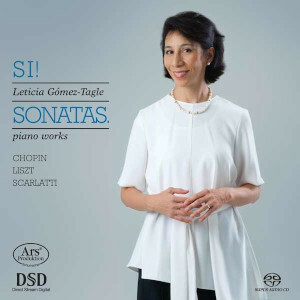 The Scherzo and finale are both virtuoso display pieces but accorded far more than status once more by the Ying&apos;s. The very opening to the finale suggests that they are going to take a very much larger-than-life approach until they musically reveal their little joke at our expense - very well played with a complete poker face (and it still works on repeated listening). Indeed, the Ying&apos;s playing in its combination of verve and musicality is reminiscent of the Mandelring Quartett. The third quartet is perhaps the most obviously recognisable as only being able to have come from the pen of Schumann and the oddly unsettling simple rhythmic devices Schumann employs are played to perfection here. As before, the Ying Quartet displays a wonderful ability to marry the incidental detail with the longer line so that the listener always there is momentum to the musical journey from the very opening to the final notes of the coda. The recording places the listener relatively far back in a very clear acoustic that, being ultra-picky, some might find just a little on the dry side. The relatively distanced positioning of the quartet means (positive spin) "the Ying Quartet&apos;s sound is very cohesive" or (negative spin) "the interplay between the various instruments loses a little of its spatial positioning"; whichever is closest to your preference I highly doubt this presentation would cause any loss of sleep. For all the merits of how "far back" we should be placed, the actual timbre of their instruments and the nuances of their performances are caught superbly well. Got this morning a pre-owned copy through Amazon Market Place. Probably from someone who didn’t think it was any good. My luck! It is every bit as good as John says. Playing is perfect and in the ’neutral spin’ I find the mc sound warm, but at times a shade too rich.